So… let’s say you were one of the early adopters of Microsoft Azure BizTalk Services (MABS) and actually put a solution in production. Everything goes swimmingly for about a year. Then one day your interfaces stop working. Moreover, you will see no error entries in tracking (actually, no entries at all for that interface), although you might see some errors from the client trying to send messages to MABS. Although the error messages you see may not be very helpful, the length of time that the service has been deployed and running should lead you to suspect some expired credentials. As it turns out, there are multiple levels of credentials and places that they are managed. The SSL certificate might be an obvious one, but many folks forget about the ACS credentials behind the service. Sure enough, your certificate has expired! Well, that explains your client connectivity issues. 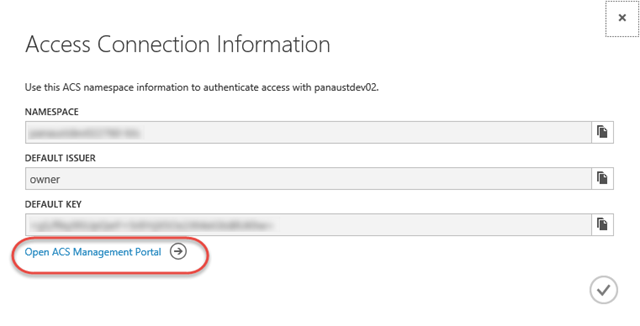 So you simply obtain a new SSL certificate and then (using the classic Azure portal) upload it using the “Update SSL Certificate” link on the dashboard. If that works, then sweet – you’re all set (probably). Of course this could be caused by an invalid certificate or the wrong password provided. But assuming that has already been verified, what do you do now? The key here is that the service has been live for at least a year. 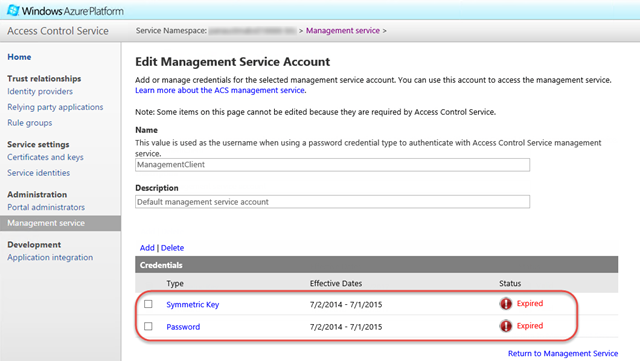 That makes the ACS credentials highly suspect, as the default expiration for a number of the keys, passwords and certificates (and there are quite a few) is one year from the service creation date. 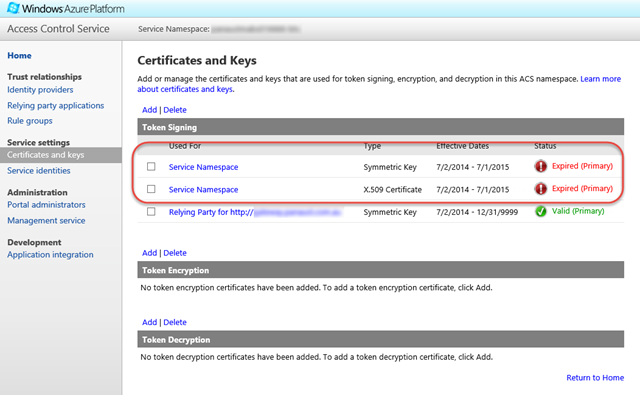 Clicking the hyperlink for the relevant item (Symmetric Key, X.509 Certificate, Password, etc) takes you to a screen that allows you to edit the expiration date and/or replace the expired certificate. So now that you’ve fixed expired ACS credentials up, will your service work again? Well, not quite… The next thing you have to do is synchronise those keys. Unfortunately, there isn’t a reliable way to do that through the portal or any other user interface. With a little help from Microsoft, I learned how to do this via PowerShell. But it needs a library to be installed first, and since that code relies on a legacy version 0.6.19 of the Windows Azure PowerShell (August 2013) you may find you have to rollback to an earlier install of this (I got this installer from here). Unzip and open the WindowsAzureBizTalkServiceManage solution (in C# subfolder) in Visual Studio 2012 (or later). Open Utility.cs and, on Line 345, change “StoreLocation.LocalMachine” to “StoreLocation.CurrentUser” . 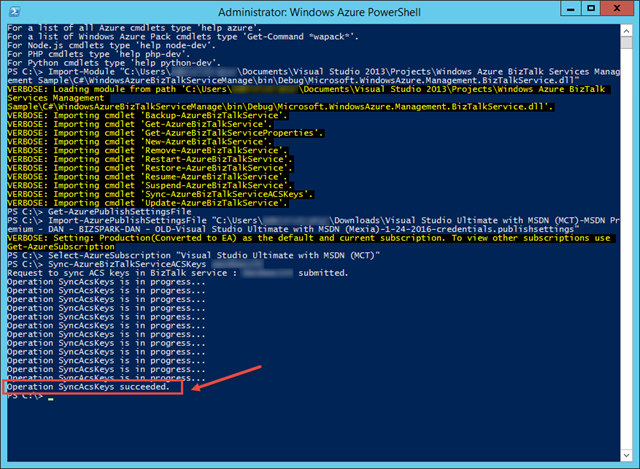 Build the solution and the Microsoft.WindowsAzure.Management.BizTalkService.dll file will be created in the \bin\Debug folder. Now you should be able to upload the new SSL certificate and get back up and running!